My one professional resolution for the year is to actually write more. The written word is the one way we can leave something behind - it’s a signpost for others, in distilled form. Edited. Reduced. Great writing lets you skip ahead, to absorb that which others had to learn the hard way. Two things kept me from writing more in the past years, and I figured the best way to unblock the blockers is to name them directly in my first post of the year. Writing is about writing the truth, or at least the truth as you see it. These days it’s clear sharing that truth makes you incredibly vulnerable. Vulnerability is about saying the things left unsaid. The loss. The mistakes. The tragedies. The unheralded wins. Let’s talk about the snake, because if we don’t, how are we ever going to keep people from being bitten? Let’s keep it in our eye line. One counterintuitive truth I’ve found is that you sometimes find yourself writing the obvious. What is obvious to you, and your direct community, is often not what is obvious to the people out there. One thing I know I need to do is acknowledge that I am in a community of incredibly smart people, but I cannot begin to hope to write things that are that novel. I think it’s easy to fall into a trap where you think you have to be the Velvet Underground: the new vanguard. There is more to write than just that which will be impressive to the insiders. In fact, properly accessible writing may well involve a good amount of review for those insiders, and help place that which might be novel in the right context. I’m looking forward to this year. Bring it on 2019. I will try to write my truth, and I welcome your advice, feedback, and hearty discussion in the months to come. I invite you to read my writing by following me on Twitter or clicking the Subscribe link below to join my Posthaven email list. I've been spending some time trying to think through where the proverbial hockey puck will be going in cryptocurrency, and here's one idea I think might work. Right now, if you put $100 in a savings account, you'd be lucky to get even $2 per year. But with this shift in cryptocurrencies to Proof of Stake, the right pick could net you $50 to $80 per year for that initial $100 investment. The dominant cryptocurrencies like Bitcoin and Ethereum operate on proof of work. Miners have to do fairly complicated math problems to figure out what the next step in the blockchain will be. In return, they get a mining reward, which is the primary form of inflation for most currencies. Proof of stake is different. Instead of expensive GPU-based or ASIC-based mining rigs, you just run a normal, non-computationally-intensive piece of software on any kind of computer, and attach your "stake" — some amount of the cryptocurrency that you are putting up as proof that you are running the right software and won't try to cheat the system. If you are caught cheating, you lose the amount you put up for stake. This is important in that now normal people who just hold the currency can actually get an interest rate on holding it. This turns crypto from a negative carry asset (like gold, or putting money in your mattress) into one that actually generates yield. 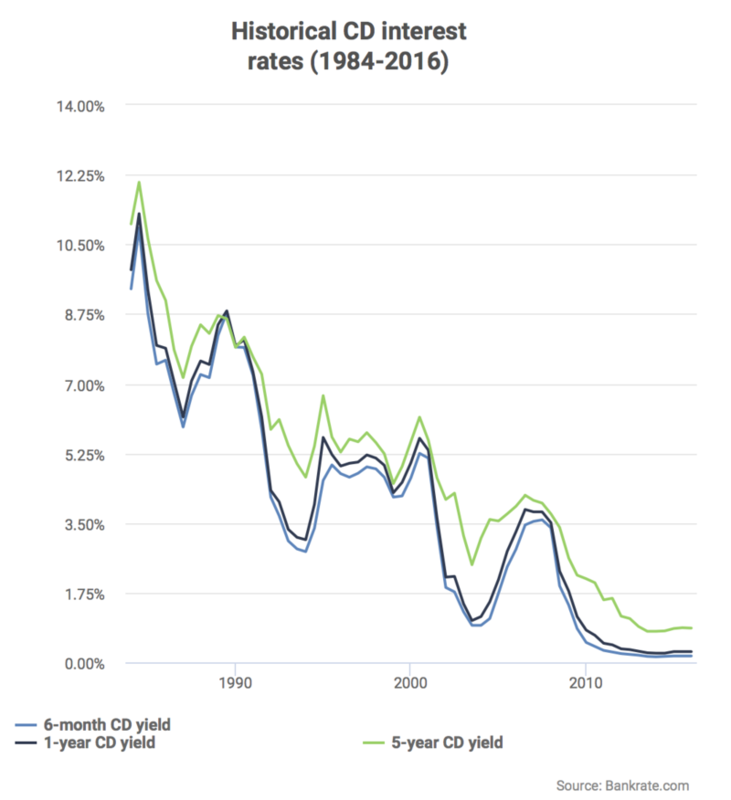 The world's capital is desperate for yield these days, which is why the stock market is so overheated, why negative or near zero interest rate lending now exists, and why people are so worried about asset price bubbles broadly. People want to grow their capital and it has never been harder to find consistent ways to get it. For instance, look at the eye-popping 11% rate of return you would get on CD's back in 1984! The days of risk-less return were our parents' generation, and not ours. But cryptocurrencies that use proof of stake for consensus have the promise of a consistent 3% to 8% annual yield, because rather than give that to miners to run the network, they can just share them with holders who are willing to stake. Proof of Stake hasn't been proven to work at the kind of scale that Bitcoin or Ethereum have had yet. Crypto experts have pretty divergent opinions on whether it will work at scale over time, which is a risk that is preventing adoption now. But as with anything new, it has to start somewhere, and that's where coins like Decred and Navcoin are leading the way in the attempt. Navcoin (at the time of writing) is around $100M market cap, and Decred is around $220M. If either of them can get to top 10 cryptocurrencies, that's a 10X in value from here. Obviously these things are always an absurdly big if, but I like it as a bet with highly asymmetric upside. Navcoin yields about 5% per year, but Decred yields up to 31% compounded per year. That's pretty amazing. But if the coin itself can 10X in value, you're looking at 50% to 80% annual yield on the initial fiat you might use to buy in. I like a one-time 50% increase in value, but what's even better than that is a a 50% to 310% yield every year into the future. Those yields stack as you increase your holdings in each cryptocurrency as well, which is another nice compounding effect similar to automatically re-investing dividends into a stock. The list of PoS coins is actually relatively long, and an exhaustive review of them is left as an exercise to the reader. An incomplete list of more popular ones in addition to the ones above include Peercoin (one of the first to do it), Lisk (largest by market cap), Nxt, and many others. I've also found browsing coin subreddits to be pretty valuable— these coins tend to live or die by developer and community interest, and you can get a great gauge on these things through their forums and subreddits. Proof of Stake is not the only way you can get yield from these coins. NEO is another coin (dubbed the Ethereum of China) that gives NEO wallet holders another coin called GAS, which at current time yields about 4.8%. The great thing is if you are an early holder of Ethereum, you'll already get this effect massively, if/when the Casper upgrade to Proof of Stake enters the picture next year. Finally, I would recommend small amounts (perhaps with a dollar cost average strategy) that you wouldn't be upset about losing, and as a part of a portfolio such that if one Proof of Stake cryptocurrency doesn't work out (and be prepared for most to stagnate or fail) you have a decent shot at owning the eventual winner. The best thing about asymmetric upside is that you can at most lose 1X, but have the potential for a lot more on the flipside. Early founders often ask whether the classifications of startups (consumer, SaaS, or Enterprise) matter a ton in terms of what kind of startup they should try to start. Is there a such thing as "founder market fit" when it comes to these stages? Unless you're an ex-Oracle sales manager founding a company, probably not. Start with what problem to solve, and then choose your tactical approach given what you know about that problem. That'll help you get to where you want to be, and let you optimize for solving a real thing that you actually want to do. Finding good startup ideas is hard enough. You don't want to complicate it by setting constraints at the wrong level of a if you can help it. A founder in China I met asked me what he should do with a business he started that has a few hundred users that are happy. He's not sure what to do next yet. The main thing is to a) figure out how you can make money, and then b) figure out how you can grow. How much you know a and b will determine whether or not you decide to raise money, or do it as a lifestyle business, or don't do it at all. It's important to figure that out as soon as you can, since those are really the only next steps from where you are. If you can grow and make a lot of money (high unit economics / margin) then you should raise money. If you can grow but can make some but not a lot, then you can probably be a good lifestyle business and you should just try to get to profitability. If you can't grow or you can't make money doing what you're doing, then don't do it. I think the most remarkable thing about this trip to China is while the markets are radically different, the fundamental problems founders face are absolutely the same. 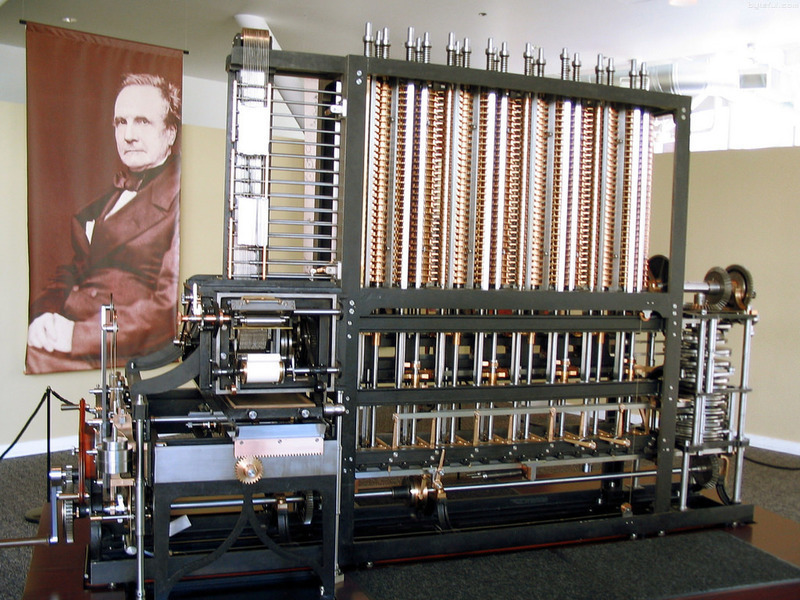 Brilliant inventor Charles Babbage designed the Difference Engine, a pioneering mechanical computer capable of storing and operating upon up to 1,000 numbers with a limit of 50 digits each. Remarkably, it wasn't until the modern era when researchers used 19th-century mechanical fabrication techniques to verify Charles Babbage's designs did work after all. In fact, no one at that time had warned that these calculating machines could not be built. Many other machines - some of them useless - were in fact built using those same Victorian era mechanical parts and tools. Instead, there were a myriad other factors contributing to the failure to physically realize the Difference Engines. These included: an argument with his lead engineer over worker compensation, run-away costs, muddled financial arrangements, wrangling with a changing British government for funding, and a resulting discontinuity of negotiations over funding and construction. Perhaps, Babbage's personality had more to do with the failure to complete the Difference Engines then the underlying technology of the time. Known by his first biographer as the "irascible genius" Babbage had lots of pride and hubris. He behaved as though being right entitled him to be rude. His quarrels with the British government and with chief engineer Joseph Clement might have doomed the project. When Clement resigned in March 1833, the practical construction of Difference Engine No. 1 stopped - 11 years after it was conceived. Negotiations with the British government continued, but funding was finally axed in 1842. Difference Engine No. 2 was conceived and designed between 1846 and 1849 - long after the design of the (never completed) Analytical Engine. Regrettably, none of these three machines were built in their entirety in Babbage's lifetime. Only years later did we recognize the potential and power of the underlying machine architectures, which were independently "discovered" by later day computer pioneers. A preventable tragedy. It was lack of interpersonal skills leading to inability to raise funds (and inability to manage execution!) that kept such a vitally important innovation from surfacing. Not the first time, and certainly not the last. Irascible geniuses everywhere must take heed as they pursue their dreams. Being smart, right, and brilliant is no license to be rude and treat people poorly. So many startups crash and burn, not because the tech didn't work or the founders weren't smart enough, but because the interpersonal neglected.